We were married in 2013. Let me tell you the story about our wedding cake. The picture on the left shows our cake as it arrived at the venue. It had been donated by a celebrity baker as our wedding was being featured in a magazine. It took a fall en route to the venue and while it was perfectly fine to eat, it obviously wouldn’t have worked for the cake cutting ceremony part of the evening. The picture on the right is the replacement cake that the folks at the Ritz made. Only one layer (the top, if memory serves) was real; the rest was styrofoam covered with fondant frosting. 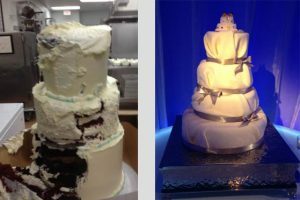 When we arrived at the venue I noticed the cake and vaguely remember thinking that it looked different but quickly moved on to other thoughts – it was our wedding day, after all. Which brings me to my point: the recent decision in the Masterpiece Cakeshop case once again says to me that none of this is about cakes, It’s not about flowers or photographs either. It is about equal dignity. Imagine if you will that the hotel’s pastry chef had refused to make a replacement cake on the grounds that our marriage violated their closely held beliefs. What would have happened then? How would we have felt? Sure, someone might have gotten their hands on some frosting and tried to fix up the original cake, but I can’t help but think about the what-ifs. I agree that we need to respect one another’s beliefs and convictions, but how do we reconcile those in a country where we have constitutional guarantees such as freedom of speech and freedom of expression when the same document also guarantees us life, liberty and the pursuit of happiness? Why should a business that’s open to the public be allowed to turn away people? Why isn’t my money as good as anyone else’s? Luckily for us, none of that happened. We had a baker than lovingly made our cake and a pastry chef that jumped in at the last minute and saved the day. But we shouldn’t have to worry about those kinds of things as a society. There’s no easy answer, and I’m sure this will continue to be debated for some time. In the Masterpiece case, the Supreme Court made their decision narrowly (not the decision, which was 7 – 2, but the opinion, which was very narrow and specific to this case) so in effect we dodged a bullet, or, as some folks have said, they “punted” and left it to be decided by a future court on a different day. I for one don’t think we’re best served as a community by being in the bakery/florist/photographer suing “business” but then again, it’s never happened to me. If it did I might see things differently. What I do know is that again, this isn’t about cake, or flowers, or photographs. It is about equal dignity, which everyone deserves. Originally posted on Facebook. Charles Chan Massey is the co-founder and Executive Director of The Personal Stories Project. He refers to himself as an “Accidental Activist” because just as he didn’t choose to be gay, he didn’t choose to become an activist. Activism chose him. You can reach Charles at charles@personalstoriesproject.org. We got married in 2013. Let me tell you the story about our wedding cake. The picture on the left shows our cake as it arrived at the venue. It had been donated by a celebrity baker as our wedding was being featured in a magazine.